I have the best friends and neighbors! They have been so supportive of this little blog of mine! They follow it, they try the recipes, they give me great feedback and they are always giving me great idea's for recipes. And when I need them too, they're the best taste testers! I owe this recipe to my good friend Lindy. She called me one day and asked if I had a recipe for a Reese's Peanut Butter Cupcake. I did not, but I came up with one. I actually experimented with a couple different idea's and settled on this one. Thanks to all my neighbors who helped me eat the experimentation's. And thanks to Lindy for the idea. I mean...anyone who has a daughter named Reese, should know how to make a Reese's cupcake...right?? 1. Preheat the oven to 350 degrees F. Line two 12 count muffin tin with paper liners. 2. In a large bowl combine the cream cheese, egg whites and vegetable oil. Using a mixer, beat the ingredients until combined and creamy. 3. Add the cake mix and water and mix until smooth, about 3 minutes. 4. Fill the muffin cups about ¾ full. Place 1 mini Reese Peanut Butter Cup on top of the batter. Do not put the cup down into the batter, just set it on top. 5. Bake about 18 to 20 minutes. The Reese’s will settle down into the cupcake as they bake. If it leaves a little of a crater or divot don’t worry, you will be topping with frosting anyway. 6. Remove from the oven and let cool slightly in the tin, then transfer the cupcakes to a wire rack. 7. When cool, frost with Chocolate Peanut Butter frosting. 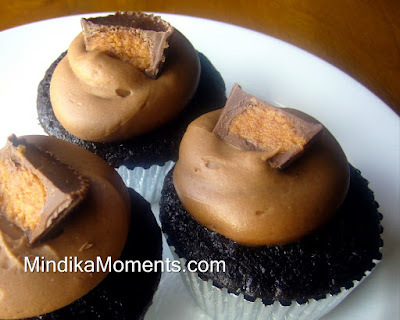 Then top each cupcake with a mini peanut butter cup sliced in half. 1. Beat the peanut butter and butter with a mixer until smooth. 2. Add the coco powder and mix well. 3. Add the powdered sugar 1 cup at a time until desired thickness of frosting. 4. If you need to thin it out a little, add a couple tablespoons of milk. b.) if I wasn't off chocolate (i know...i know), i would make these right. now. d.) you really are so talented. I love that i love your blog even when I don't really cook that much. THAT'S a good blog! Reese's are my daughters favorite candy. I will have to make these for her birthday in December but first I must try them out and make sure they are delicious which I am sure they are. I'm so hungry! Those look fantastic and give me ideas for a great cake idea! I feel so privileged to be mentioned on this blog!!!!!!!! YUM!!!!!!!!!!!!! I'm trying this asap!!!! One day I need to come to your house and have you show me how you frost all your cupcakes like this! They are beautiful!!! You are so talented Mindi! Thanks for all your tips and tricks and delicious recipes. Love this blog! Oh and p.s. did you get the powdered sugar finally! ?